When it comes to enjoying the home that you own, you might also think about having a garden as part of your overall landscape design. But you really look forward to being able to relax in your yard, so this garden should not require too much care on your part. 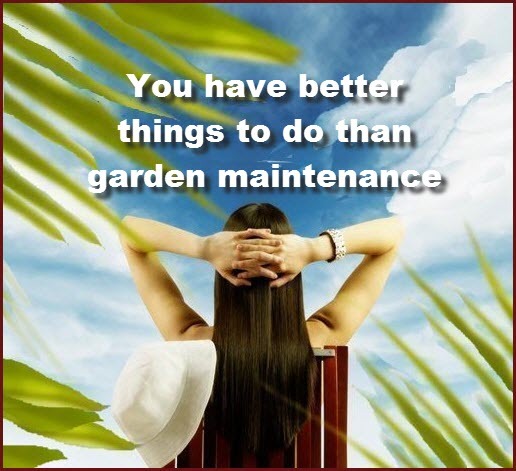 After all, we don’t get too many nice days out of year to relax outdoors here in the Minneapolis area, so you may not want to spend those lovely days on garden upkeep. You may not think it’s possible to have a beautiful garden without it taking up a lot of your time, but with the right planning, you can have a relatively low-maintenance spot that’s got plenty of beauty for you to enjoy. Here are some tips for creating a ‘lazy’ garden and how you might be able incorporate this in your yard. A big part of a low-maintenance garden is choosing the right plants and having them properly planted in your garden space. You need to consider the water and fertilizer requirements of the plants that you choose, since some require more work than others. It’s very helpful if you choose an assortment of plants with the same basic sun, water, and fertilizer needs. As a rule, native species are much less demanding than other plants and are much more tolerant to being neglected. You should also choose plants that stay relatively compact and don’t require frequent dividing or cutting back. Avoid any flowering plants that must be dead-headed to maintain blooms, and by all means, select flowering perennials rather than annuals which have to be put in each year. Flowering shrubs such as hydrangeas provide plenty of color and gorgeous blossoms without much care. Select species appropriate to the moisture, sunlight, and soil conditions in your yard. If the area is wet and boggy, you might want to consider plants that love to live in moisture. If it is directly in a hot sunlit spot, then you want to choose sun-loving plants. Dry and rocky? No problem – chose those that thrive in these conditions. There are many plants for each type of condition that require minimal effort at keeping them alive, but you have to make sure that you find and choose these plants. That’s where a knowledgeable nursery or professional landscape design contractor can be helpful. Being able to enjoy a garden earlier in the spring and then late into fall is something you should aim for, so you need to make sure that you choose plants that reach their peak simultaneously together as well as incorporating those that bloom at different times. They should also hide each other’s flaws when they do bloom. Bulbous flowers such as crocuses and tulips are ideal for the spring time, but come the end of spring they will die back, so there should be other later-blooming plants springing up just as those early bloomers are fading. Incorporating low-maintenance, attractive foliage plants in among the flowering ones can really help bridge the gap between seasons. You can also add shrubs such as dogwood that have red bark to add color in the winter. Follow nature when it comes to creating this type of garden, since you want nature to be the one that cares for the plants mostly. Instead of those well planted, manicured gardens that you see in magazines, think of something a bit more rustic – still beautiful and all your own. Rockeries are a great way to add a boost of beauty in the yard, require minimal maintenance and give off a natural scene. Bulbs can be strewn haphazardly and then planted where they fall – you’ll get a more natural look than if you plan a layout. To relax in your yard more with less work, consider adding a ‘lazy’ garden as well as other low-maintenance landscaping. Architectural Landscape Design has a lot of landscaping solutions to cut down on your yard maintenance chores so that you’re able to enjoy the great outdoors more. Enjoy some of our garden projects found on our Pinterest boards; then give us a call to discuss your landscaping dreams. We offer free intial consultations.